Last issue of Crypto Wars I said we'd need a big ol' stick to wake BTC from its slumber. Unfortunately, now we need an even longer one. 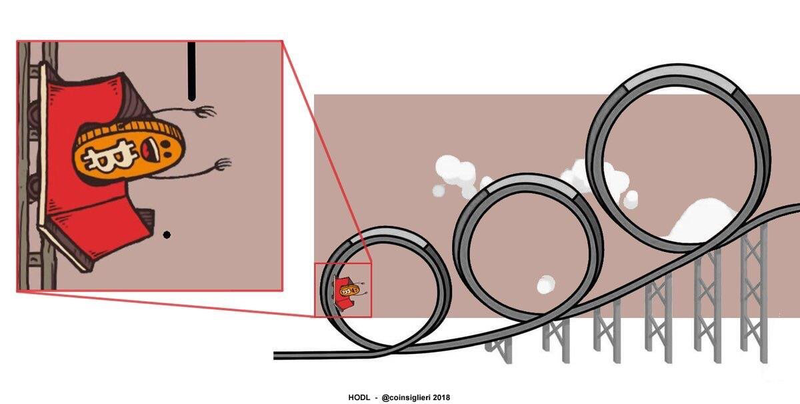 Things have been bleak in crypto land, to say the least, with all cryptos retreating significantly over the past couple of weeks, and then sharply declining this past weekend. Bitcoin hit a low-point on Wednesday, at around US$6,280, a price level not seen since early February (when things were also looking pretty damn bleak). Ethereum dropped as low as US$459 -- also on Wednesday. But then, SEC to the rescue!! "If the network on which the token or coin is to function is sufficiently decentralized – where purchasers would no longer reasonably expect a person or group to carry out essential managerial or entrepreneurial efforts – the assets may not represent an investment contract. Moreover, when the efforts of the third party are no longer a key factor for determining the enterprise’s success, material information asymmetries recede. As a network becomes truly decentralized, the ability to identify an issuer or promoter to make the requisite disclosures becomes difficult, and less meaningful." The other big development that could be expedited by the SEC announcement is the launch of a Ether futures market. Today, Cboe confirmed as much, saying: "This announcement clears a key stumbling block for ether futures, the case for which we've been considering since we launched the first bitcoin futures in December 2017." Still a complete and utter bloodbath, but it would have been even worse had the SEC not made the statements they made. Better luck next week!? In a recent note, Tom Lee, Fundstrat's head of research, wrote that since the launch of Cboe bitcoin futures in December, prices have plunged leading up to expiration. "Bitcoin sees dramatic price changes around CBOE futures expirations. This was something flagged by Justin Saslaw at Raptor Group. We compiled some of the data and this indeed seems to be true," Lee wrote Thursday. "Overall, bitcoin has fallen 18 percent in the 10 days prior to CBOE contract expiration." The Cboe bitcoin June futures contract expired Wednesday, with prices hitting a four-month low during the session. "A broader observation is there is significant volatility around these expirations," Lee added. "And on average, the price recovered by day six [following expiration]." Bitmain, the dominant force in bitcoin mining, has reportedly raised $400 million as it gears up to go public later this year. Regional media outlet China Money Network reports that the funding round, which values the China-based firm at $12 billion, was led by Sequoia Capital China, a VC that has been quite active in the nascent cryptocurrency space. Bitmain has not yet confirmed the funding round publicly. The $12 billion valuation matches Bitmain’s internal estimates but exceeds that of many external analysts, who estimated that the firm was worth between $8.8 billion and $10 billion. According to the report, Bitmain plans to hold an initial public offering (IPO) on the Stock Exchange of Hong Kong in September and expects to go public with a market cap between $30 billion and $40 billion. The EOS blockchain is now live. The blockchain has received more than the 150 million votes needed to determine the individuals or entities that will maintain the distributed network, the world's fifth largest by total value, thus ending a weeks-long process that had been among the most complex the evolving cryptocurrency market has perhaps ever seen. The news effectively ensures that the software for which a company called Block.one raised more than $4 billion during an almost year-long initial coin offering (ICO) will now be accessible. The Port of Rotterdam Authority has signed a cooperation agreement with Dutch blockchain startup CargoLedger to use the technology for cargo tracking, Transport Online reported yesterday, June 14th. As part of its PortXL annual accelerator, the port authority has partnered with CargoLedger to implement a blockchain solution for tracking shiploads. The technology will be applied in order to improve quality control in supply chains and establish a transparent and secure system to innovate the management and handling of cargo. "The concept is so, I guess the word is bizarre. You have to blank your mind and say, 'What is blockchain, again? How does mining operate, again?' The concepts are really strange, and yet when you begin to grasp it, it makes sense." U.S.-based crypto wallet and exchange Coinbase’s Index Fund is now open for large-scale investors, according to an official blog post published yesterday, June 13. The fund, whose creation was announced in March, is available only to U.S. resident accredited investors who invest between $250,000 and $20 mln. The index includes Bitcoin (BTC), Ethereum (ETH), Litecoin (LTC), Bitcoin Cash (BCH), as well as Ethereum Classic (ETC), whose addition to Coinbase was announced on June 11. Coinbase’s blog post notes that the fund will be rebalanced to include any future assets listed on Coinbase. Open source software "eyeo", which is the company behind the ad-block software Adblock Plus, has announced a new browser extension that will verify the legitimacy of news. The extension, which is called Trusted News, is intended to utilize blockchain technology in the future, and be moved to the Ethereum blockchain. San-Francisco-based bank Wells Fargo has announced that it will no longer allow its customers to purchase cryptocurrency using its credit cards, Fortune reported June 11. Wells Fargo, which is the third largest bank by assets in the US, said that its customers are now prohibited from purchasing digital currency on their credit cards issued by the financial institution. A bank spokesperson said that the decision was made in order to avoid “multiple risks” associated with cryptocurrency usage. Coinbase announced its intention to add support for Ethereum Classic (ETC) in the coming months. They will now begin the engineering work for supporting ETC, with the final testing phase expected to occur sometime in the next few months. A launch date for trading will be announced at a later time. The U.S. Commodity and Futures Trading Commission (CFTC) has reportedly subpoenaed four cryptocurrency exchanges in a bid to obtain their trading data as part of an investigation into market manipulation. According to a The Wall Street Journal report on Friday, the financial market regulator is demanding comprehensive trading data from Bitstamp, Coinbase, itBit and Kraken, which altogether serve as a base for the bitcoin futures price listed by CME Group. Ant Financial, the payment affiliate of Chinese internet giant Alibaba, announced on Friday it has raised $14 billion (!!) in a Series C round funding, which will be used to further develop new technologies such as blockchain. Stephen Bannon, co-founder of Breitbart News and former Chief Strategist for U.S. President Donald Trump’s administration, is planning to enter the world of crypto, the New York Times reported yesterday. According to the Times, Bannon has held private meetings with both crypto investors and hedge fund managers about the possibility of conducting an ICO through his investment firm, Bannon & Company. Back in school, we likely had days where we just weren’t in the mood for research or homework, and whipped up a paper last minute. Apparently, the RBI — India’s central bank — was in that same kind of mood the day it decided to ban cryptocurrencies. 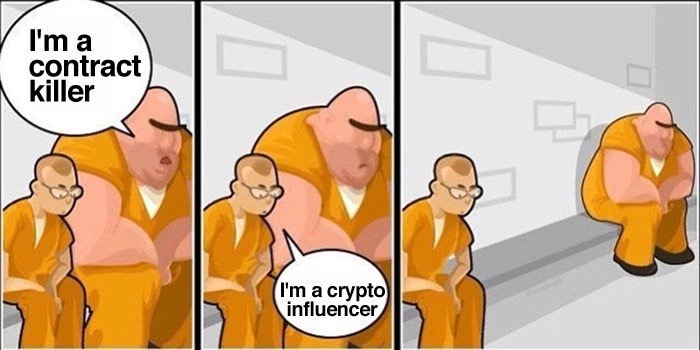 "I hold a lot of cryptocurrencies and mainly Bitcoin. I am buying more. 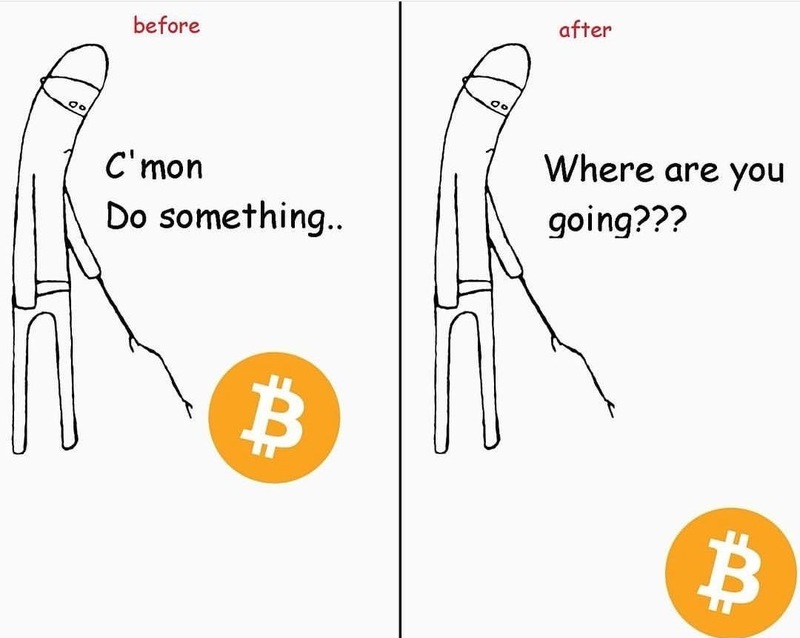 I feel that crypto and Bitcoin are the future. Fiat is the past. I do still have to hold some fiat currency for everyday transactions today, but I suspect that that will change over the next few years. I cannot wait to be able to go to a store and make purchases using cryptocurrencies. Fiat currency will eventually become as passé as trying to pay for coffee with pennies." "I expect that since cryptocurrencies will increase the velocity of money, the current $86 trillion global market for currency will grow to be about $140 trillion in the next 10 years, and that growth will be in crypto. In fact, I estimate that fiat currencies will actually decrease in use, and that crypto will become as much as $100 trillion of that market. 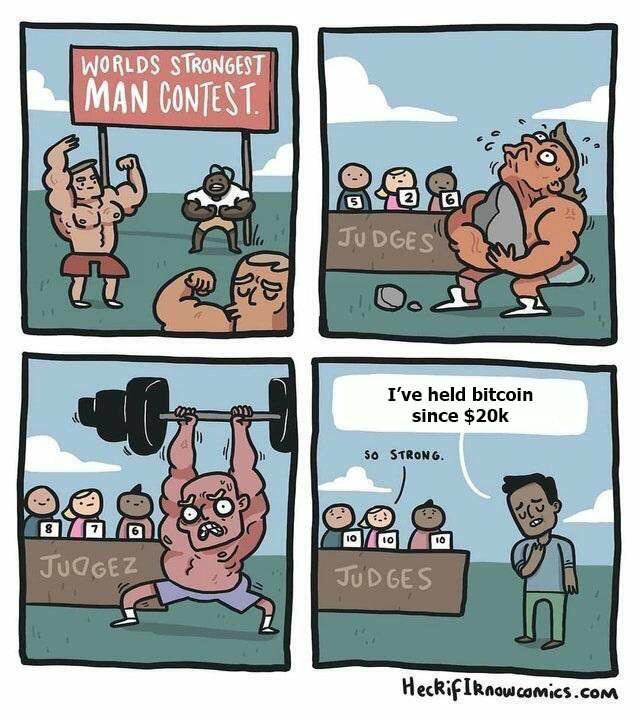 I expect Bitcoin to be about 10% of that market, or $10 trillion. There is a lot of room to grow there." There's a lot to be disappointed with if you've been watching HIVE's share price lately. But its mining farms continue to hum along 24/7, spitting out crypto, and it's not too much longer until the company's first Bitcoin mine comes online (in September). While in theory miners like HIVE should not suffer the same level of volatility as the cryptocurrency market itself, in reality HIVE's stock price has followed the ups and downs of Bitcoin and Ethereum pretty closely, hitting highs in late 2017 and for the most part declining ever since. I firmly believe we'll see a resurgence of interest and excitement in crypto this year, and with it another boom in coin prices. I am patiently waiting for this to happen, and when it does I think the climb will be swift and steep. LIVE is not a pure crypto or even blockchain play, but if successful, could be the company to successfully commercialize blockchain technology (as well as AI) to disrupt the traditional sectors we've all been hearing are ripe for such an upgrade. So far, the only real blockchain use case of any value is cryptocurrencies, but that will no doubt change. I would encourage you to read the full report here -- Laughed out of 84 Investor Meetings -- to understand all the moving pieces in the company. Suffice it to say, there are a number of compelling assets in place today and an extremely ambitious plan on where they want to go from here. Their #1 asset, in my opinion, is founder (and CEO/Chairman) Anthony Lacavera, who famously took on Canada's wireless oligopoly with WIND Mobile, which he sold to Shaw Communications for $1.6 billion in 2015. His next big move is Globalive Technology. This is a long term play for Anthony, who had this to say: “GT is the rest of my career. I am fully committed to building a long term, huge company here. I don’t care what people think. That’s what I’m doing.” Looking forward to seeing him pull this off. Overstock shares jumped 11% from US$35.50 to US$39.40 following Johnson’s comments, and closed out the week at US$38.90. 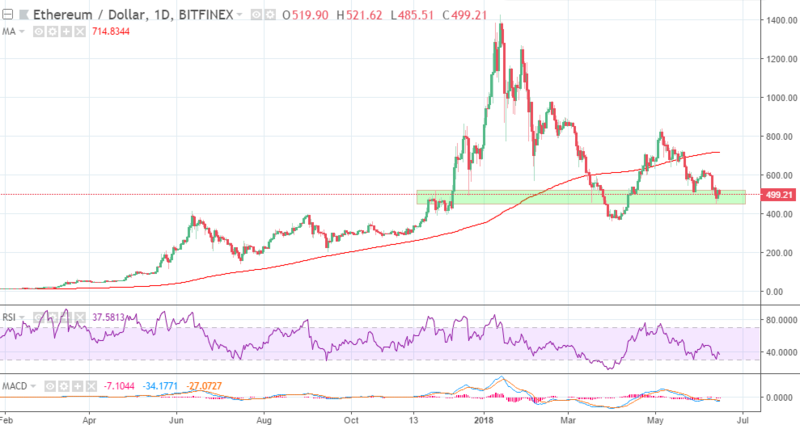 While Bitcoin has so far held up above critical support at $6,000, several other leading cryptocurrencies snapped through major support levels. This breakdown in Monero is about as ugly as it gets from a technical perspective; the measured move target from the descending triangle breakdown is.....$0. Several other cryptos (Litecoin, etc.) suffered similar technical breakdowns last week, as a result all of those levels of previous support should now represent resistance on the way back up. Turning to Ethereum, ETH/USD found support at $450 on Wednesday and looks to be ending the week right around the $500 level. $500 in Ethereum has been an important level dating back to November of last year when Ether spent a couple of weeks consolidating around this level before blasting higher in December. 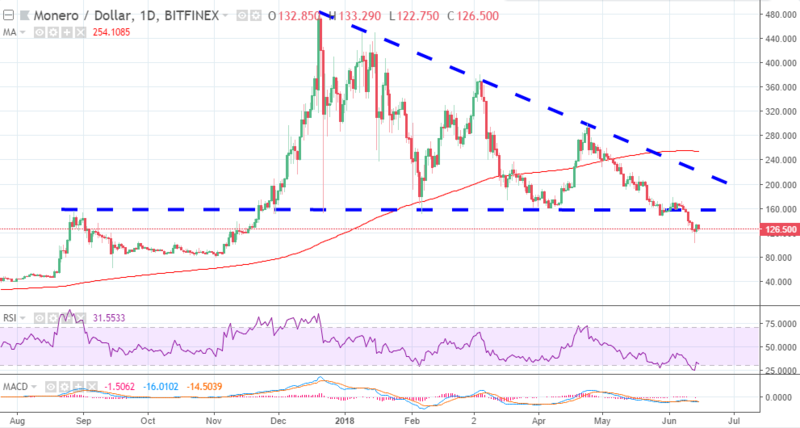 Ethereum has also impressively outperformed Bitcoin as evidenced by the fact that ETH/USD is well above its March low while BTC/USD is below its March low. Given the extent of the carnage in cryptos this week, and the extreme bearish sentiment percolating across the space, a weekly close above $500 is impressive. 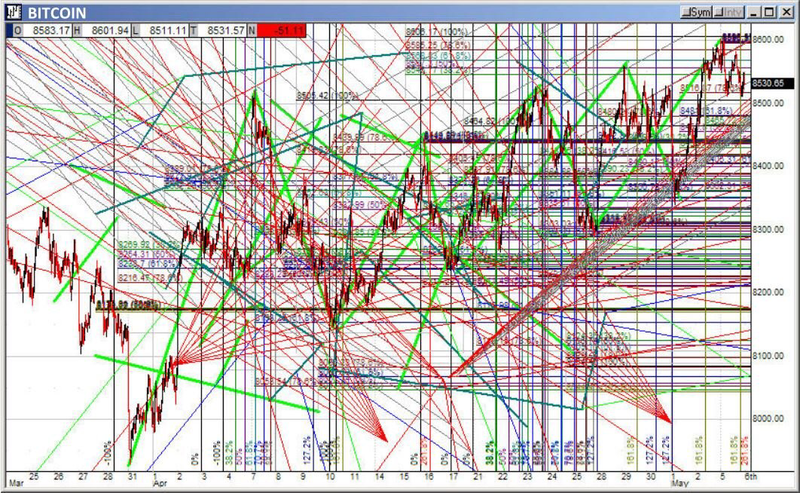 After glancing through a dozen crypto charts it's clear that the technicals are poor enough that it's tough to find much to be optimistic about. However, from a contrarian standpoint the bearish sentiment in the crypto sector has become so extreme that any self-respecting contrarian must at least be paying attention now. 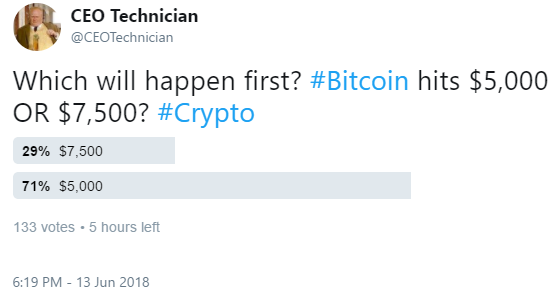 On Wednesday I posted a poll on Twitter asking which would happen first, Bitcoin $5,000 OR $7,500 - it turns out that nearly 3 out of 4 respondents see $5,000 happening first. This is particularly interesting because Bitcoin was pretty oversold by any measure at Wednesday's low. Moreover, the $6,000 level is major support, a logical area from which a rebound could take place. 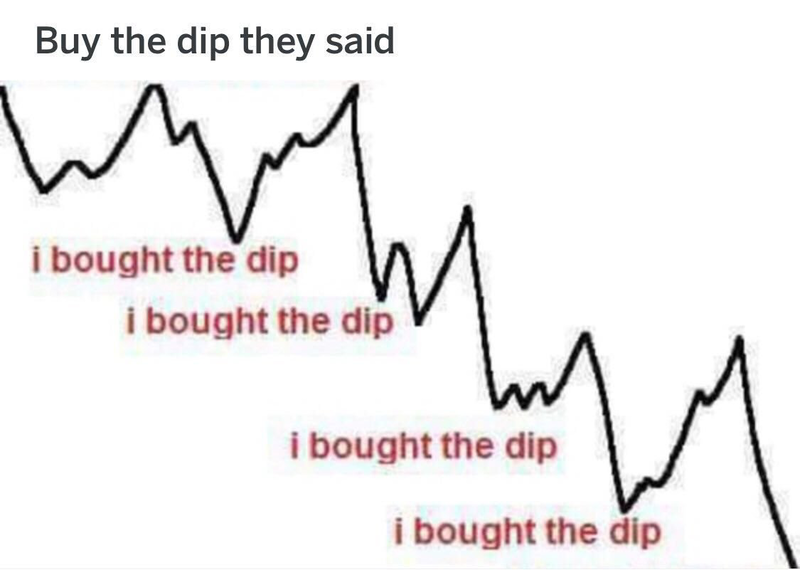 There have also been numerous anecdotes of former crypto bulls giving up and tossing in the towel in the last week. In the span of a little less than six months we've gone from one extreme to the other extreme. The ingredients for a major bottom are beginning to form, however, something tells me we're just not quite there yet.